Happy Fall Loves! Chicago has been up and down when it comes to weather; what else is new? Looks like this week will be mid 70's! And I hope it stays that way! :-) Skirts and strapped heels are my two favorites no matter what season it is. I stuck with dark colors, and accessorized it with my black handbag, camouflage baseball cap, and gold watch. This outfit looks just as fab with slip-ons too! I bought this camouflage baseball cap over the summer, and have not had a chance to wear it out so much, but will start to for this season! 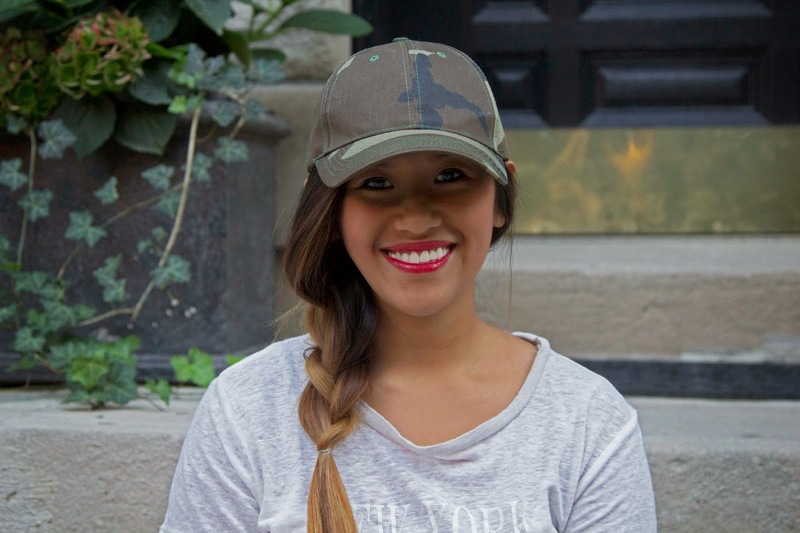 I used to think baseball caps are more of a masculine accessory, and can only be worn to sports games, a day of errands, or on messy hair days. But this cap can be worn more ways than you could ever imagine. So don't shy away from pairing it with a skirt, dress or heel, you'll be surprised at how chic you still can look! You're killing that red lip, lady! I would have never thought to pair the camo cap with such a chic skirt and shoe, but I AM SO LOVING THE ENTIRE LOOK! I love this look. It is a fetching mix of sporty and girly chic. The skirt is just adorable and I like the pop of color the shoes add. Love the look, and I also love your shoes. You look great. Thank you so much for stopping by, following, and your kind words! I LOVE how you matched your nails, lip, and shoes. It added a great pop of color to a neutral toned outfit, and it wasn't too matchy matchy! I would have never thought to put a camo anything on that would look so dressy and chic! What a cutie pie!! I love it with the slip ons too - so effortless! I have never seen camo looks so good!! I love this loo from head to toe!! You styled it perfect! That skirt is so adorable! I love the way you styled it - both dressed up and casually. You look great in both outfits. But I have to say, the casual style with the slip-ons and the hat is my favorite! Also, the red shoes - very cute!